Britain has voted to leave the European Union in a referendum that has sent tremors through financial markets around the world. The historic decision triggered a plunge in the value of the pound and Prime Minister David Cameron’s resignation. The world’s fifth largest economy now faces uncharted waters, with a period of uncertainty ahead about growth, trade and investment prospects. So what are the economic implications of the vote? There are still many unknowns. For one thing, it remains to be seen what sort of post-Brexit relationship the UK will have with the EU: a free-trade agreement set-up similar to Switzerland? 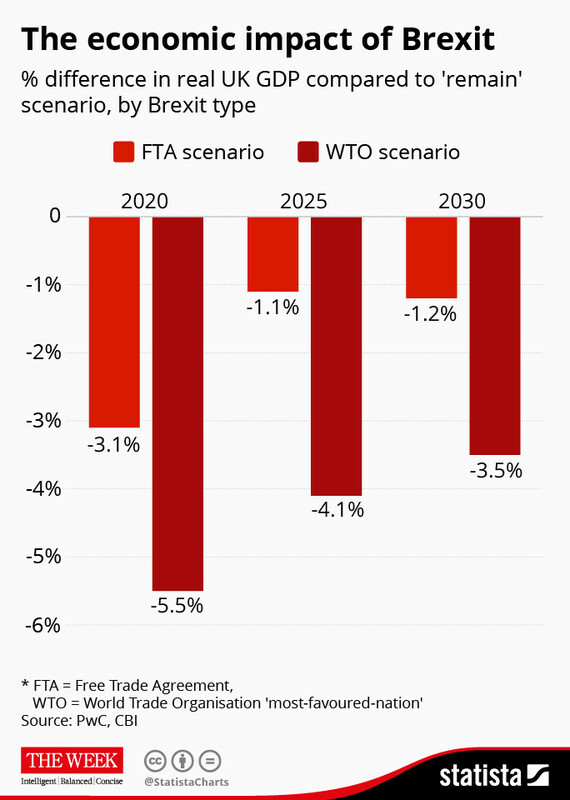 Or what's referred to as the WTO scenario, where the UK and the EU revert to World Trade Organization rules, which would involve tariffs on goods sold between the two regions? Here’s a roundup of quotes on what Brexit could mean for Britain’s economy. The International Monetary Fund estimated that an EU exit could mean the UK misses out on up to 5.6% of GDP growth by 2019. On the short and long-term prospects for the British economy, London-based economic research consultancy Capital Economics said: “ The outcome clearly creates considerable short-term uncertainty which is likely to weigh on the UK economy in the coming quarters. Leaving the EU puts Britain’s access to the EU’s barrier-free single market in jeopardy and means it will need to make new trade deals with countries around the world. In April, US President Barack Obama urged Britons to stay in the EU, warning they would be at “ the back of the queue ” for a US trade deal. “It’s fair to say that maybe some point down the line there might be a UK-US trade agreement but that's not going to happen anytime soon because our focus is negotiating with a big bloc, the European Union, to get a trade agreement done. Writing in the Guardian ahead of the referendum, the UK’s European Commissioner, Jonathan Hill , argued that membership of the single market was in Britain’s best interests. But Boris Johnson, former London mayor and Leave campaigner , argues that leaving the EU would allow the UK to do trade deals with developing economies around the world. The pound fell more than 10% against the dollar to levels last seen in 1985 over fears that leaving the EU could harm investment and threaten London's role as a global financial capital. Mark Boleat, policy chairman for the City of London Corporation , the financial watchdog, said the vote would have “significant” implications for Britain, but that he did not believe there would be a mass exodus of banks and financial institutions. “With markets having wrongly bet on a Remain win in the past few days, and with patchy liquidity sure to amplify price movements, there will be severe pain for levered long investors and, potentially, opportunities for cash-rich ones. The Bank of England said it would take all measures necessary to secure monetary policy and help the UK economy move forward. Mark Carney, Governor of the Bank of England , said in a statement : “A few months ago, the Bank judged that the risks around the referendum were the most significant, near-term domestic risks to financial stability.